Complex UI&apos;s require many controls. It is likely these controls need to be grouped, positioned, and sized with set policies. 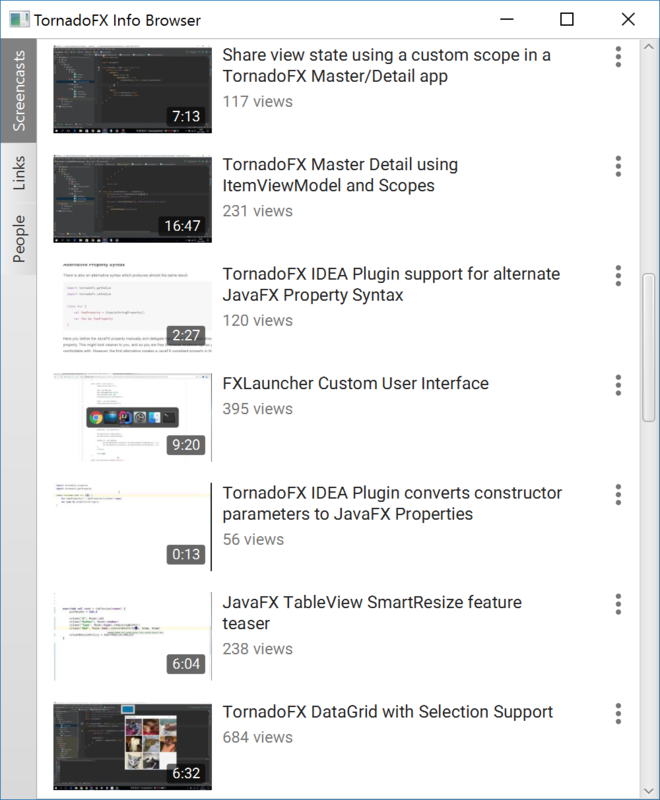 Fortunately TornadoFX streamlines many layouts that come with JavaFX, as well as features its own proprietary Form layout. TornadoFX also has type-safe builders to create menus in a highly structured, declarative way. Menus can be especially cumbersome to build using conventional JavaFX code, and Kotlin really shines in this department. Layouts group controls and set policies about their sizing and positioning behavior. Technically, layouts themselves are controls so therefore you can nest layouts inside layouts. This is critical for building complex UI&apos;s, and TornadoFX makes maintenance of UI code easier by visibly showing the nested relationships. A VBox stacks controls vertically in the order they are declared inside its block (Figure 7.1). You can also call vboxConstraints() within a child&apos;s block to change the margin and vertical growing behaviors of the VBox. You can use a shorthand extension property for vGrow without calling vboxConstraints(). HBox behaves almost identically to VBox, but it stacks all controls horizontally left-to-right in the order declared in its block. You can also call hboxconstraints() within the a child&apos;s block to change the margin and horizontal growing behaviors of the HBox. You can use a shorthand extension property for hGrow without calling hboxConstraints(). The FlowPane lays out controls left-to-right and wraps to the next line on the boundary. For example, say you added 100 buttons to a FlowPane (Figure 7.3). You will notice it simply lays out buttons from left-to-right, and when it runs out of room it moves to the "next line". The FlowLayout is not used often because it is often simplistic for handling a large number of controls, but it comes in handy for certain situations and can be used inside other layouts. 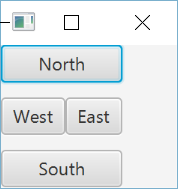 The BorderPane is a highly useful layout that divides controls into 5 regions: top, left, bottom, right, and center. Many UI&apos;s can easily be built using two or more of these regions to hold controls (Figure 7.5). You will notice that the top and bottom regions take up the entire horizontal space, while left, center, and right must share the available horizontal space. 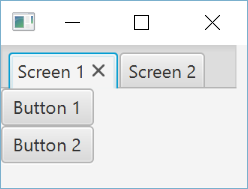 But center is entitled to any extra available space (vertically and horizontally), making it ideal to hold large controls like TableView. For instance, you may vertically stack some buttons in the left region and put a TableView in the center region (Figure 7.6). BorderPane is a layout you will likely want to use often because it simplifies many complex UI&apos;s. The top region is commonly used to hold a MenuBar and the bottom region often holds a status bar of some kind. You have already seen center hold the focal control such as a TableView, and left and right hold side panels with any peripheral controls (like Buttons or Toolbars) not appropriate for the MenuBar. We will learn about Menus later in this section. 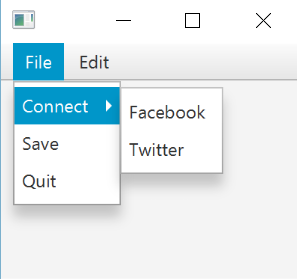 TornadoFX has a helpful Form control to handle a large number of user inputs. 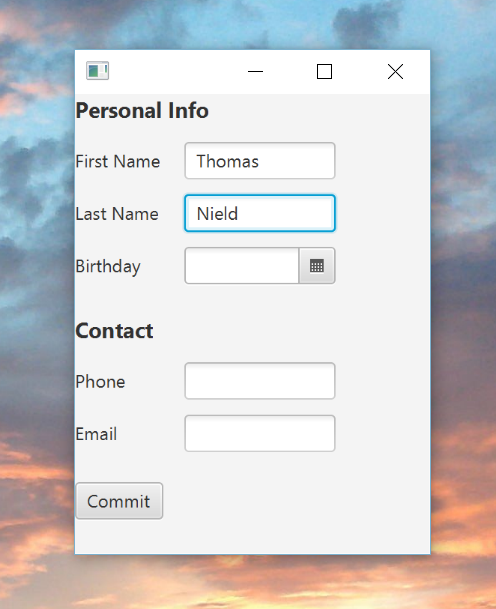 Having several input fields to take user information is common and JavaFX does not have a built-in solution to streamline this. To remedy this, TornadoFX has a builder to declare a Form with any number of fields (Figure 7.7). Awesome right? You can specify one or more controls for each of the fields, and the Form will render the groupings and labels for you. The example above also uses the buttonbar builder to create a special field with no label while retaining the label indent so the buttons line up under the inputs. You bind each input to a model, and you can leave the rendering of the control layouts to the Form. For this reason you will likely want to use this over the GridPane if possible, which we will cover next. You can wrap both fieldsets and fields with any layout container of your choosing to create complex form layouts. The HBoxes are configured with a spacing of 20 pixels, using the parameter for the hbox builder. It can also be specified as hbox(spacing = 20) for clarity. 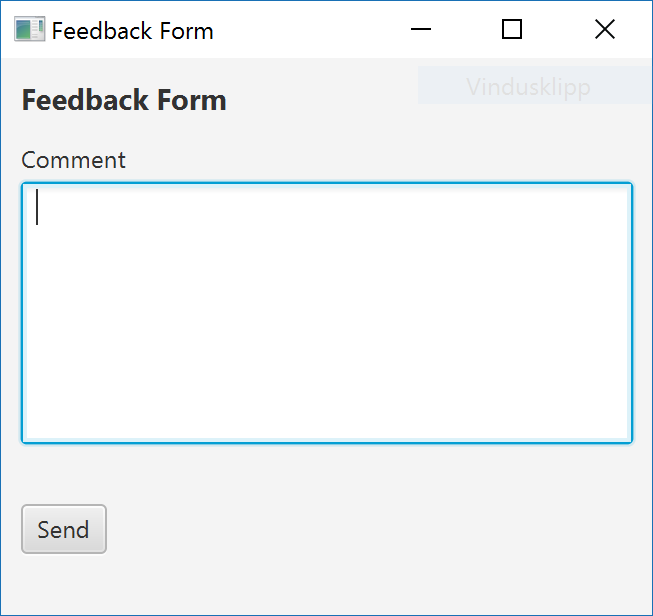 As a part of the TextInputControl, filterInput is a convenient way to restrict user input in form fields. filterInput accepts the changes to form fields and compares them against your filter. If the filter evaluates to true, the input is accepted. 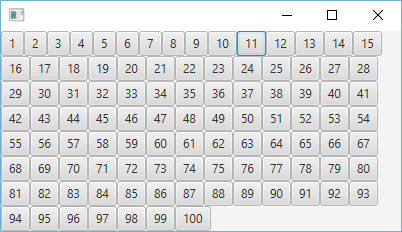 In the following example, a textfield has it&apos;s input restricted to integers between 0 and 10. The code above checks if change was triggered by adding new text with isAdded or evaluates the new text against an a function to determine if the text entered, it, isInt() and is within the range of 0-10. If any of the checks return false, the user input will be rejected and they will not be able to input those characters. If you want to micromanage the layout of your controls, the GridPane will give you plenty of that. Of course it requires more configuration and code boilerplate. Before proceeding to use a GridPane, you might want to consider using Form or other layouts that abstract layout configuration for you. Notice how there is a margin of 10.0 between each row, which was declared for the marginBottom and marginTop of the "North" and "South" buttons respectively inside their gridpaneConstraints. Alternatively, you can explicitly specify the column/row index positions for each Node rather than declaring each row of controls. This will accomplish the exact layout we built previously, but with column/row index specifications instead. It is a bit more verbose, but it gives you more explicit control over the positions of controls. These are all the gridpaneConstraints attributes you can modify on a given Node. Some are expressed as simple properties that can be assigned while others are assignable through functions. Additionally, if you need to configure ColumnConstraints, you can call gridpaneColumnConstraints on any child Node, or constraintsForColumn(columnIndex) on the GridPane itself. 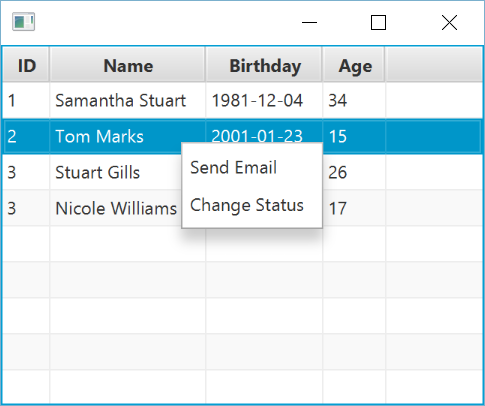 A StackPane is a layout you will use less often. For each control you add, it will literally stack them on top of each other not like a VBox, but literally overlay them. For instance, you can create a "BOTTOM" Button and put a "TOP" Button on top of it. The order you declare controls will add them from bottom-to-top in that same order (Figure 7.10). 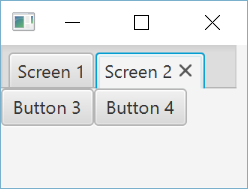 A TabPane creates a UI with different screens separated by "tabs". 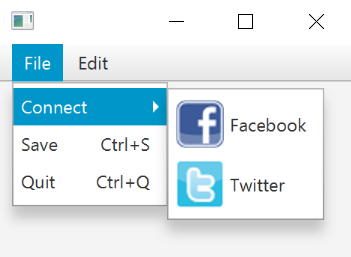 This allows switching between different screens quickly and easily by clicking on the corresponding tab (Figure 7.11). You can declare a tabpane() and then declare as many tab() instances as you need. For each tab() function you will build your hierarchy of nodes inside, starting with the container node. 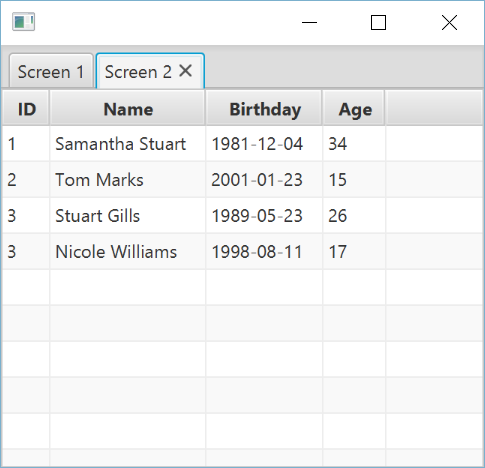 TabPane is an effective tool to separate screens and organize a high number of controls. The syntax is somewhat succinct enough to declare complex controls like TableView right inside the tab() block (Figure 7.13). Like many builders, the TabPane has several properties that can adjust the behavior of its tabs. For instance, you can call tabClosingPolicy to get rid of the "X" buttons on the tabs so they cannot be closed. Creating menus can be cumbersome to build in a strictly object-oriented way. But using type-safe builders, Kotlin&apos;s functional constructs make it intuitive to declare nested menu hierarchies. It is not uncommon to use navigable menus to keep a large number of commands on a user interface organized. For instance, the top region of a BorderPane is typically where a MenuBar goes. There you can add menus and submenus easily (Figure 7.5). You can also optionally provide keyboard shortcuts, graphics, as well as an action function parameter for each item() to specify the action when it is selected (Figure 7.14). 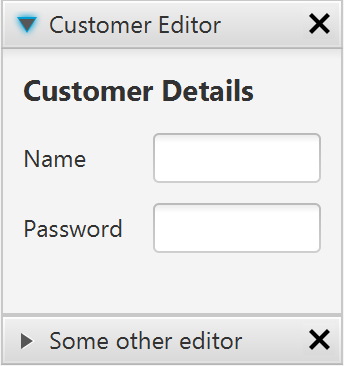 You can declare a separator() between two items in a Menu to create a divider line. This is helpful to group commands in a Menu and distinctly separate them (Figure 7.15). 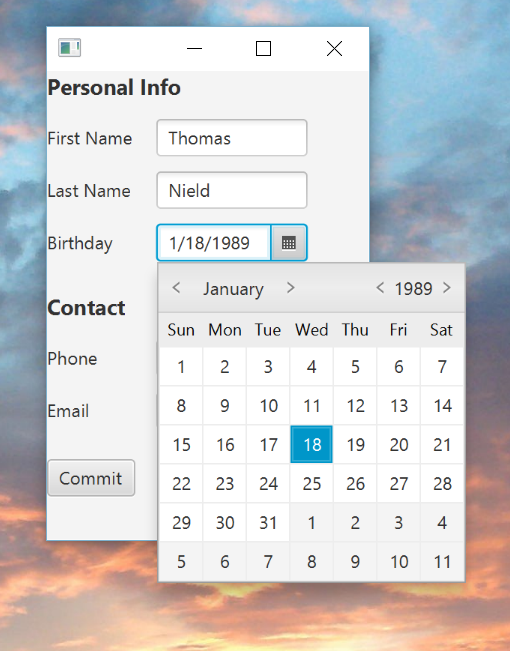 Most controls in JavaFX have a contextMenu property where you can assign a ContextMenu instance. This is a Menu that pops up when the control is right-clicked. A ContextMenu has functions to add Menu and MenuItem instances to it just like a MenuBar. 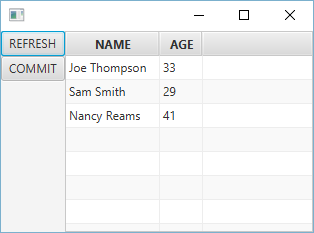 It can be helpful to add a ContextMenu to a TableView<Person>, for example, and provide commands to be done on a table record (Figure 7.16). 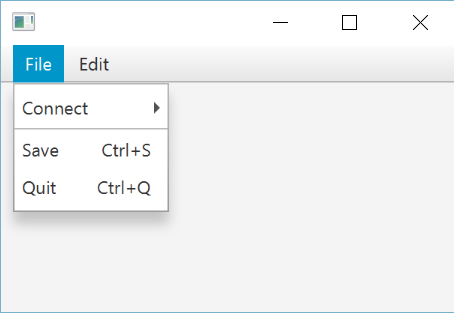 There is a builder called contextmenu that will build a ContextMenu and assign it to the contextMenu property of the control. Note there are also RadioMenuItem and CheckMenuItem variants of MenuItem available. The menuitem builders take the action to perform when the menu is selected as the op block parameter. Unfortunately, this breaks with the other builders, where the op block operates on the element that the builder created. Therefore, the item builder was introduced as an alternative, where you operate on the item itself, so that you must call setOnAction to assign the action. The menuitem builder is not deprecated, as it solves the common case in a more concise way than the item builder. 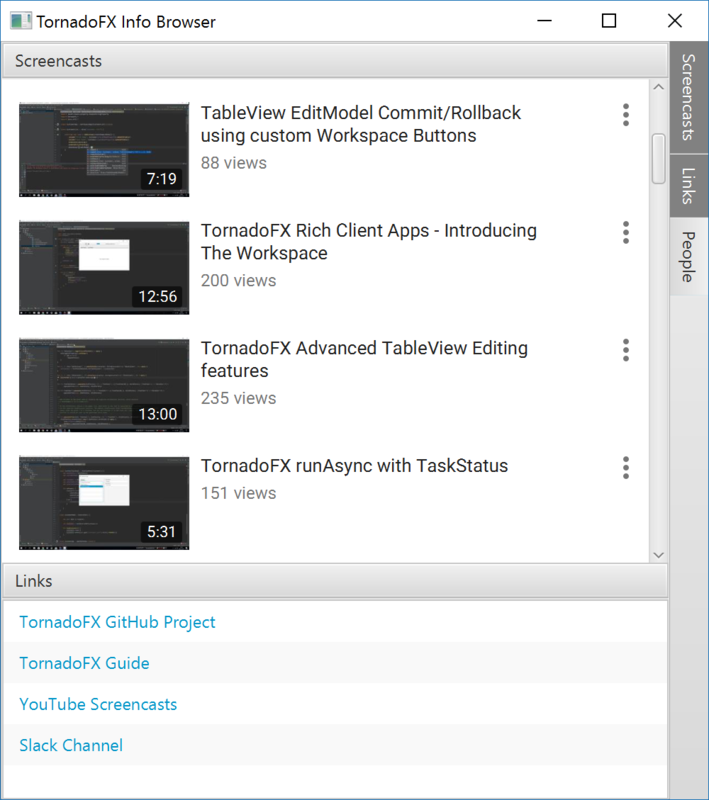 TornadoFX comes with a list menu that behaves and looks more like a typical ul/li based HTML5 menu. // Marks this item as active. theme yes String null Currently supported themes blue, null. If null is set the default gray theme is used. .list-menu -fx-graphic-fixed-size 2em The graphic size. .list-menu .list-item -fx-cursor hand The cursor symbol. .list-menu .list-item -fx-background-insets 0 0 -0.5 0, 0, 0.5, 1.5 The insets of each item. .list-menu .list-item .label -fx-text-fill -fx-text-base-color The text color of each item. .list-menu .list-item:active -fx-background-color -fx-focus-color, -fx-inner-border, -fx-body-color, -fx-faint-focus-color, -fx-body-color The color will be set if the item is active. .list-menu .list-item:active -fx-background-insets -0.2, 1, 2, -1.4, 2.6 Insets will be set if the item is active. .list-menu .list-item:hover -fx-color -fx-hover-base The hover color. text yes String? null The text which should be set for the given item. graphic yes Node? null The graphic can be any Node and will be displayed beside the given text. whenSelected A convince function, which will be called anytime the given ListMenuItem is selected. The useMaxWidth property can be used to fill the parent container horizontally. The useMaxHeight property will fill the parent container vertically. These properties actually applies to all Nodes, but is especially useful for the ListMenu. 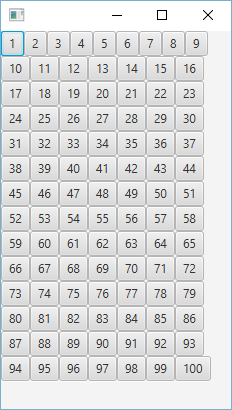 JavaFX has an Accordion control that lets you group a set of TilePanes together to form an accordion of controls. The JavaFX Accordion only lets you open a single accordion fold at a time, and it has some other shortcomings. To solve this, TornadoFX comes with the SqueezeBox component that behaves and looks very similar to the Accordion, while providing some enhancements. You can tell the SqueezeBox to only allow a single fold to be expanded at any given time by passing multiselect = false to the builder constructor. You can optionally allow folds to be closable by clicking a cross in the right corner of the title pane for the fold. You enable the close buttons on a per fold basis by passing closeable = true to the fold builder. The closeable property can of course be combined with expanded. You can style the SqueezeBox like you style a TitlePane. The close button has a css class called close-button and the container has a css class called squeeze-box. The Drawer is a navigation component much like a TabPane, but it organizes each drawer item in a vertically or horizontally placed button bar on either side of the parent container. It resembles the tool drawers found in many popular business applications and IDEs. When an item is selected, the content for the item is displayed next to or above/below the buttons in a content area spanning the height or width of the control and the preferred width or height of the content, depending on whether it is docked in a vertical or horizontal side of the parent. In multiselect mode it will even let you open multiple drawer items simutaneously and have them share the space between them. They will always open in the order of the corresponding buttons. The drawer can be configured to show the buttons on the right side, and you can choose to support opening multiple drawer items simultaneously. When running in multiselect mode, a header will appear above the content, which will help to distinguish the items in the content area. 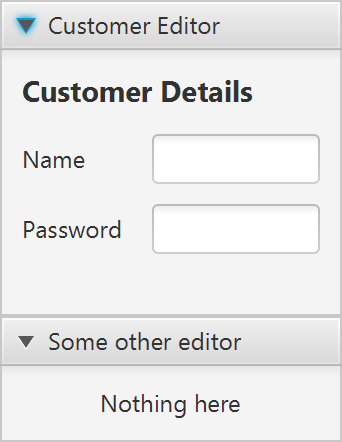 You can control the header appearance with the boolean showHeader parameter. It will default true when multiselect is enabled and false otherwise. When the Drawer is added next to something, you can choose whether the content area of the Drawer should displace the nodes next to it (default) or float over it. The floatingContent property is by default false, causing the Drawer to displace the content next to it. You can control the size of the content area further using the maxContentSize and fixedContentSize properties of Drawer. Depending on the dockingSide, those properties will constrain either the width or the height of the content area. The Workspace features built in support for the Drawer control. The leftDrawer, rightDrawer and bottomDrawer properties of any Workspace will let you dock drawer items into them. Read more about this in the Workspace chapter. By now you should have the tools to quickly create complex UI&apos;s with layouts, tabbed panes, as well as other controls to manage controls. Using these in conjunction with the data controls, you should be able to turn around UI&apos;s in a fraction of the time. When it comes to builders, you have reached the top of the peak and have everything you need to be productive. All that is left to cover are charts and shapes, which we will cover in the next two chapters.